Love traveling with your pup? 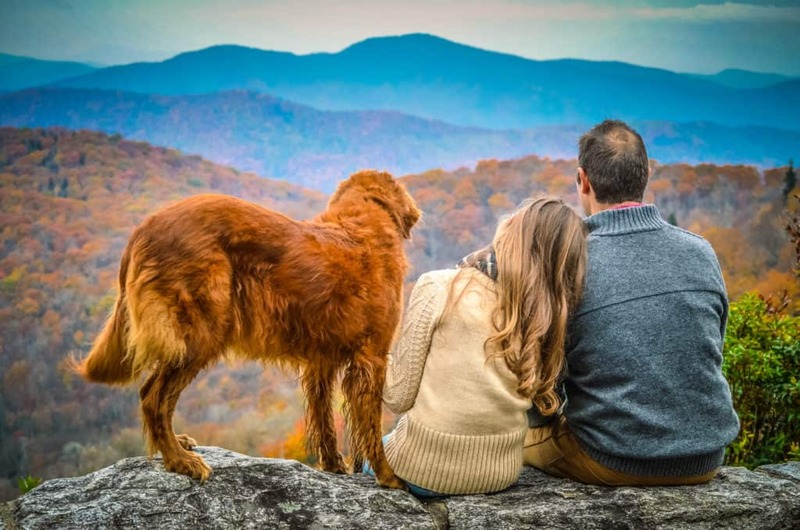 Bring them along because Haywood County is one of the best dog-friendly vacation spots in Western North Carolina. Enjoy puptastic hikes, cool swimming holes, tasty restaurants with plenty of outdoor seating and delicious breweries that will welcome your four-legged friend with open paws. There is so much fun to be had that your pup may be begging you to stay an extra day! Coffee Cup Cafe’s outdoor deck offers panoramic views of the North Carolina Smokies and is the perfect spot to enjoy breakfast with your best “fur”iend. The cafe prides itself on using locally grown and produced ingredients to create its fresh menu. If you need a jump start, don’t miss out on its homemade coffee drinks. Also known for its creative lunch offerings like the Turkey Florentine Grill, go ahead and grab a picnic spread for today’s hiking adventure. Hop on I-40 West toward Tennessee, but before you cross the state line, take Exit 7 at Harmons Den and turn right onto Cold Spring Rd. A six-mile drive up a beautiful winding road will bring you to the Max Patch parking area. Max Patch is a 4,600-foot mountain bald offering acres of wide-open clearings that offer amazing, unobstructed views and plenty of room for your pup to run free. Multiple hiking trails can be accessed, including a popular section of the Appalachian Trail. There’s no doubt you and Fido worked up a thirst, so treat yourself to an afternoon at our craft breweries. Haywood County is home to three locally owned and operated microbreweries and one distillery: Boojum Brewing, BearWaters Brewing Co, Frog Level Brewery, and Elevated Mountain Distillery are all pup-friendly! Spend the afternoon trying out their various taps and don’t forget to grab a growler of your favorite brew to take home. A great place to wind down after a full day of fun with Fido! The Rendezvous Restaurant and outdoor Tiki Bar are located at the Maggie Valley Inn, where dogs are happily welcomed at the outdoor Tiki Bar. The Rendezvous Restaurant menu features yummy favorites like Southern fried chicken, ribs, steaks, seafood and the best hand-breaded chicken tenders in town. Stop by Trailhead Café & Bakery and grab yourself a fresh breakfast sandwich or sweet pastry to go along with a cup of coffee. While you’re there, pick up a picnic lunch, because today you’re heading for the Blue Ridge Parkway. Afterwards, head down the street to Smoky Mountain Dog Bakery and let your pup pick out some special treats. Voted as one of “America’s Best Bakeries for Dogs” by The Daily Meal, this unique dog bakery prides itself on its homemade dog treats that are both healthy and tasty. There is also a wide range of specialty dog toys and accessories you won’t find anywhere else in town. The 46 miles of the Blue Ridge Parkway that run through Haywood County are one of the most popular attractions in the area. After breakfast head up Hwy. 276 to hop on the Parkway. Go south, and just past milepost 420 look for the road to Black Balsam on the right. The Black Balsam Knob area is the perfect customizable hike for you and Fido. This section of trails includes some of the most spectacular mountains and balds in the Southern Appalachians, including Black Balsam Knob, Sam Knob and Tennent Mountain. These treeless mountaintops draw people from afar thanks to their sweeping views and alpine appearance. After a morning of hiking, find a cool rock or grassy patch and enjoy your delicious picnic. Does your pooch love a cool dip in a mountain stream? Hop off the Parkway at the Hwy. 215 overpass and head down the mountain toward the town of Canton. Once you reach the bottom, you will come upon the Sunburst Swimming Hole on your right. With two main swimming areas, this area is local favorite for both two-legged and four-legged swimmers. All the water originates within the mountains surrounding the creek, so you will find some of the freshest (and coldest) water around to cool off in. If your pooch prefers a leisurely stroll instead of a brisk swim, take a drive to Lake Junaluska for a beautiful afternoon walk. This 2.6-mile loop around the lake is dog-friendly and includes a walk through a fragrant rose garden, which is a treat for both dog and human noses alike! Southern Porch—located in a historic, restored Victorian-style inn established in the late 1800s—is casual family fine dining at its best. They pride themselves on serving up a wide variety of local favorites in a relaxed atmosphere. Their friendly staff love their four-legged patrons and are happy to cater to their needs. This family-owned quick dine shop offers friendly personalized service while serving up delicious food. Grab a traditional sandwich or flatbread pizza with a side salad. The two picnic tables out front are perfect for sitting with your pup, or make it to-go and head to the Dog Park. Before you pack up and head home, let your pooch run off some of his energy at Waynesville’s Pepsi Dog Park. Located just 10 minutes from Canton at Waynesville’s scenic Recreation Park, the Pepsi Waynesville Dog Park is a safe and fun environment to enjoy a round of fetch before the ride home. The park consists of two designated areas: large breeds and small breeds. And if a game of fetch isn’t enough, the park offers a scenic walking trail to take a stroll on before leaving. The above itinerary is a SAMPLE itinerary. It was put together to provide you with an idea of the many wonderful places to visit and dine at while visiting the North Carolina Smokies. Other restaurants and attractions can be substituted based on your preferences and seasonality to create a unique itinerary for your next visit. See how TV host Ashley Mengwasser and her pup, Rosie, spent their time in Haywood County!